Much of what kids play with eventually ends up in their mouths. That’s especially true when what they are playing with is a brightly colored and has a consistency that’s somewhat food-like, as is the case with Play-Doh. So when possible it can be a good (and potentially hospital-trip averting) idea to let kids play with something they can safely eat, as is the case with Yummy Dough. Yummy Dough is the creation of Sarah and Luisa, who know a little something about what kids like. They’re kids themselves! The product is most easily described as an edible clay. But Yummy Dough is more than merely non-toxic. The play stuff is literally packaged as—and meets all the sanitary and legal requirements of—food. As with any packaged food you’d buy in the grocery store, Yummy Dough’s nutritional information and ingredients list is published on the box. Those ingredients—enriched wheat flour, icing sugar, powdered vegetable shortening, dried whole eggs, artificial color and flavors—aren’t exactly the foundation for good nutrition, but they aren’t the absolute antithesis of it either. How does Yummy Dough taste? you wonder. Pretty good, actually. A little like slightly bland raw sugar cookie dough. We’d say that most people would like eating it but few would choose it over, say, ice cream or cake or regular cookie dough. Spot Cool Stuff spent an afternoon playing with our review sample of Yummy Dough along with a 7-year-old Spot Cool Stuff-ette. 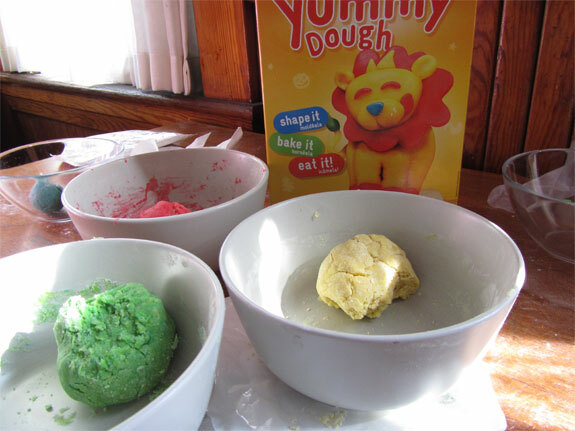 The immediate difference between Yummy Dough and Play-Doh: The latter is a toy that kids can pull out for 10 minutes of play and then put back. Yummy Dough is an afternoon project. You’ll need at least five bowls, four spoons and a clean work area. 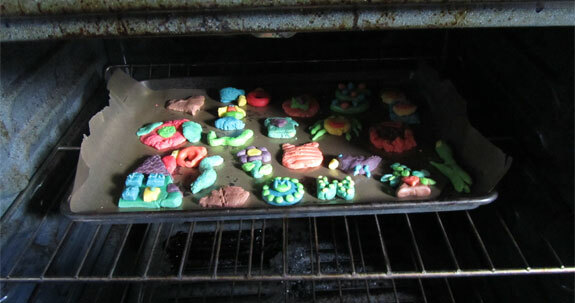 If you want to cook your Yummy Dough creations (an optional step) a cookie sheet and wax paper is required. We found that it helps to have an additional five or six other bowls as well as sculpting aids, such as toothpicks. 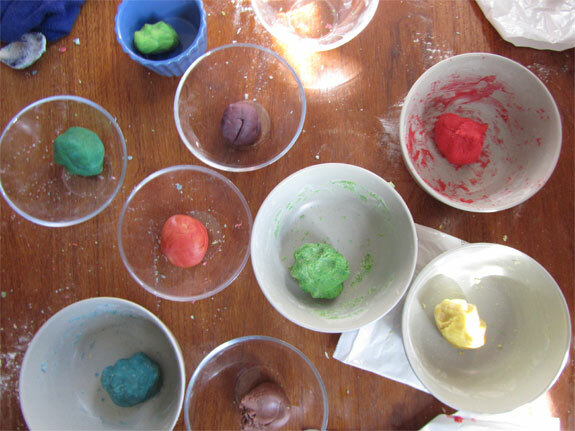 Start your Yummy Dough adventure by opening the powder packets and mixing each with water to create four primary color dough balls. The key is only adding the water called for in the directions; an included syringe makes it easy to measure exactly. Soon after you start mixing you’ll be tempted to add more water. Don’t! The dough will eventually form. The mixing can get a bit tedious so it helps to have more than one adult to help. 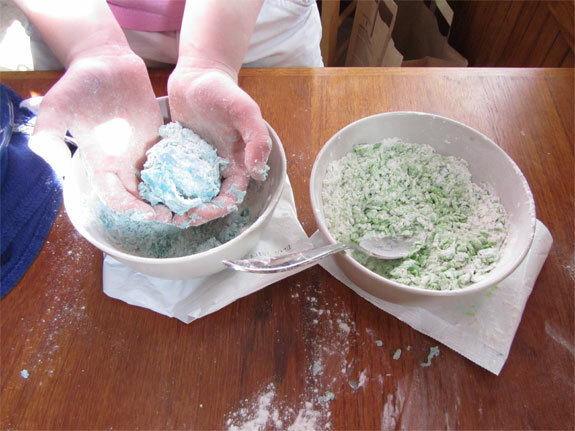 Once you have your red, green, blue and yellow dough made you can mix together combinations of those to create other dough of other colors. Our kid tester loved seeing the new colors appear. Next, it’s time to sculpt doughy creations. Yummy Dough is a bit drier than fresh-out-of-the-container Play-Doh but otherwise you’d be hard pressed to tell the difference between them—unless you’d tried eating them. Nibbling on the Yummy Dough while playing with it is part of the fun. 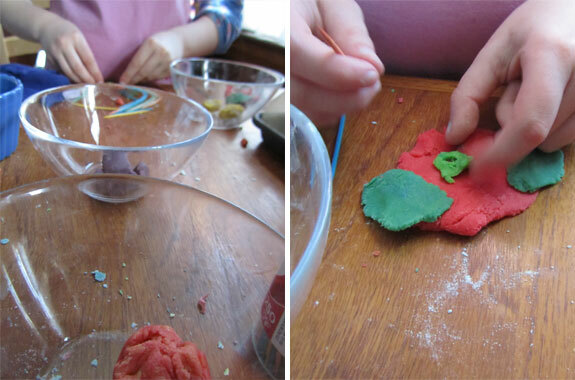 (With Play-Doh, not so much). The catch is that raw Yummy Dough is only playable for around 24 hours after it is mixed with water. It becomes too dried out to sculpt with after that. 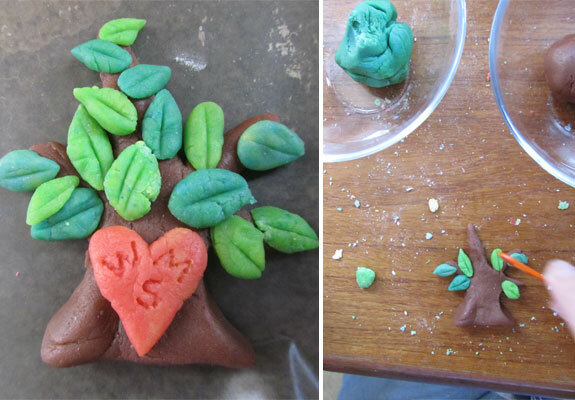 However, if you like you can cook your Yummy Dough art and enjoy them in cookie form. 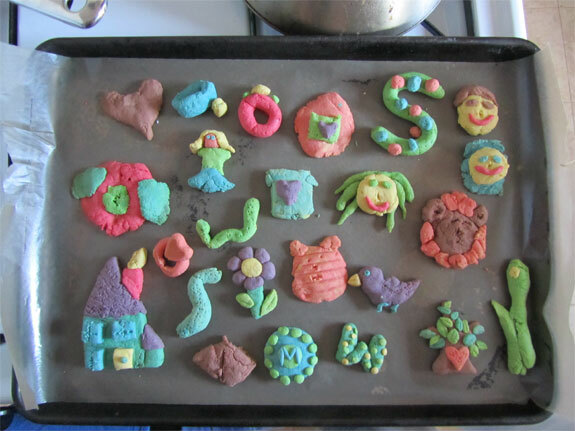 We could see Yummy Dough being a cool birthday party activity or rainy day fun for multiple children. It was a huge hit with our kid. As for adults . . . well, typically Spot Cool Stuff only reviews toys that adults would have fun playing even without kids. Yummy Dough doesn’t quite meet that standard. 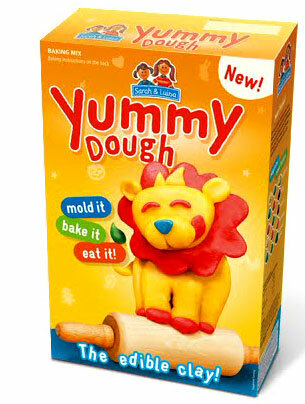 But as a way to spend quality time with kids Yummy Dough is fun and delightful. And delicious too.